Recognition for outstanding service within a volunteer service organization is something somewhat expected for those who serve above and beyond the norm, but awarding a non-member is a bit unique. 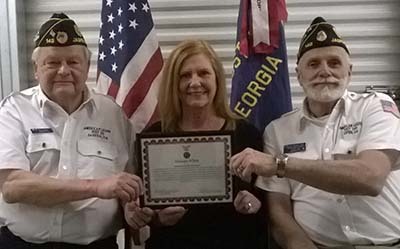 That is exactly what happened at last month’s American Legion Post 149 monthly meeting when Melanie Whitt was given a certificate of volunteer excellence for her untiring support of the post’s many activities. Whitt, wife of legion member Steve Whitt saw an opportunity to help and she jumped in with both feet in last year’s Bluegrass Festival hosted by the legion. The hours were beyond counting in the months leading up to the 3 day festival. Melanie utilized her vast experience of fund raising from her work as a member of the City of Canton Economic Development Committee and her own personal fund raising efforts when serving as a state representative.